Wetherby Civic Society has formally lodged opposition to the Leeds City Plan to allocate land to the east of the A1(M) at Wetherby for 1,080 houses. Roger Taylor, the Chairman of the Wetherby Civic Society claimed that there appears to be no thought given to this proposed site allocation. “The amendments to the existing plan appear to have been made in haste as a result of the failure of the Headley Hall site to go forward,” said Mr Taylor. “This proposed additional site is not an extension of Wetherby, to which the A1(M) forms a natural barrier, and would require the facilities of a new settlement. “Wetherby already has developments with 438 houses being built and the Plan includes another 251 units excluding this new settlement. 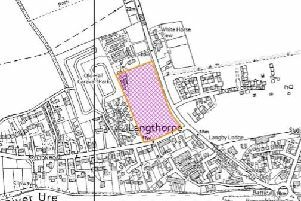 Committee member, Peter Catton, said that it looks as if Leeds City Council was trying to smuggle this allocation of land use into the plan. “There has been little publicity about the draft plan. “We, as the local Civic Society and interested in the structure and cohesion of the local community, were not contacted directly and only found out about it from the headlines in the Wetherby News. Submissions ended on November 7. It will go to Development Plan Panel in December and The Pre-Submission changes are expected in February.